Can You Tell the Difference Between Ads and "Recommended" Native Content? As technology has advanced advertisements have become more seamlessly integrated into websites causing consumers to mix up what is advertisement and what is editorial content. Adiant, a provider of digital advertising solutions and ownder of Adblade, has announced the results of their “Native Advertising Industry Survey”. 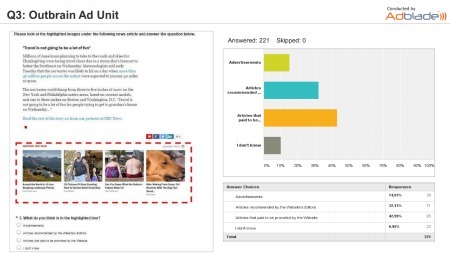 The survey asked more than 220 consumers to identify various advertising and content widgets as advertisements or editorially recommended content. The consumers were shown images of content widgets and asked to identify them as advertisements, articles that paid to be promoted by the website, articles recommended by the website editors or that they did not know if they were ads or editorial content. The survey found that when adwidgets were labeled with words such as “Recommended for You” or “You May Like” 30-40 percent of consumers’ responded saying they either did not know what the widget was or that it was editorial content recommended by the website’s editors. On the other hand, when the widgets were labeled with a title such as “Offers and Articles” the number of consumers that believed it was editorial content decreased significantly to 10-15 percent. "Disclosures remain an important issue to companies in our industry and even though consumers are becoming increasingly savvy, it is still up to us to make sure consumers know what type of information they are consuming," said Ash Nashed, Adiant's CEO.